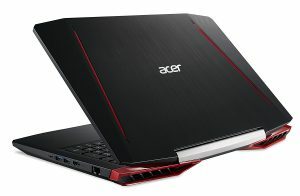 Acer Aspire VX 15 VX5-591G-75RM is a modern 15.6 inch Full HD gaming machine with a unique dynamic design of sharp angles and iron-red backlit keyboard for dynamic gaming. Graphics card is the modern GTX 1050 Ti with a 4GB of GDDR5 VRAM dedicated graphics memory and a video card benchmark score of 5786 which will give you advanced gaming performance in the latest games of 2016 and 2017 at high settings and resolutions along with more than acceptable frame rates per second. 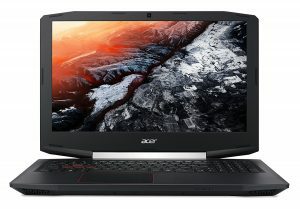 The high-end technical specs for aggressive performance include the seventh generation quad-core Intel i7-7700HQ processor (6MB cache) at 2.8 GHz speed up to 3.8 GHz with turbo boost and hyper threading for four cores to handle eight threads, 16GB DDR4 SDRAM memory at 2400MHz for superior multitasking power for just about any type of user, 256GB M.2 Solid State Drive for both speed and snappy performance and English Windows 10 64-bit operating system. Intel Core i7-7700HQ has an impressive benchmark score of around 9000 at the time of this review. 15.6 inch Full HD LED-backlit widescreen display has the 1920 x 1080 pixel resolution and the IPS panel with up to 178-degree viewing angle. The image quality on its FHD display is very good even in the sunlight and at almost all the angles with the LG IPS panel. The built-in graphics card is the Intel HD 630 with a reasonable video card benchmark score of 1270 which is equal to a lower high-end performance for a smooth operation of general multimedia and some gaming. So the system will use this built-in card for the usual media stuff and switch to the dedicated GTX 1050 Ti when heavier gaming tasks require it. Black Acer Aspire VX 15 (NH.GM4AA.001) weighs 5.51 pounds and measures 15.31 x 10.45 x 1.14 inches- fairly lightweight for what it is and good size. Connectivity options include the 10/100/1000 Gigabit Ethernet with RJ-45 connector, 802.11ac wireless (dual band 2.4GHz and 5GHz) and Bluetooth 4.0, 2 x USB 3.0 ports (1 with power-off charging), a USB 3.1 Type C port, a USB 2.0 port, and an HDMI output but there is no DVD drive. Despite being a powerful gaming laptop with an FHD screen you can expect up to 6 hours of battery life in non-gaming tasks from its 3-cell lithium ion battery 4605 mAh). It includes the dual fan cooling system with back discharge and with the great cooling performance you can game longer and the fans don’t work at all during normal browsing so you hear zero noise. The laptop chassis doesn’t have a very premium feel but with its matte texture it doesn’t really attract fingerprints and looks sleek and premium. The keyboard is red backlit with a single brightness setting, with WASD keys redder than the rest. And it is comfortable to type but the keys don’t make much noise and don’t have a very tactile feel. The touchpad doesn’t have the separate left and right click buttons and feels smooth overall without any lagging. Aspire VX comes with a high definition webcam with a 1280 x 720-pixel resolution that supports HDR- High Dynamic Range. Sound quality is pretty good through the two integrated stereo speakers and Dolby Audio Premium and Acer TrueHarmony. What’s not good about this powerful gaming machine is the lack of a large storage and with the complimentary kit shipped promptly by Acer support team on request and the low price of HDDs you can install one easily. And the kit is made up of a 2.5-inch bracket with SATA and power cable (it already comes with a 2.5” HDD bay). It has a high-end powerful mobile graphics card and a very powerful i7 processor, a great cooling system, decent battery life, a beautiful gaming machine design with sharp edges that make this an impressive gaming laptop overall.